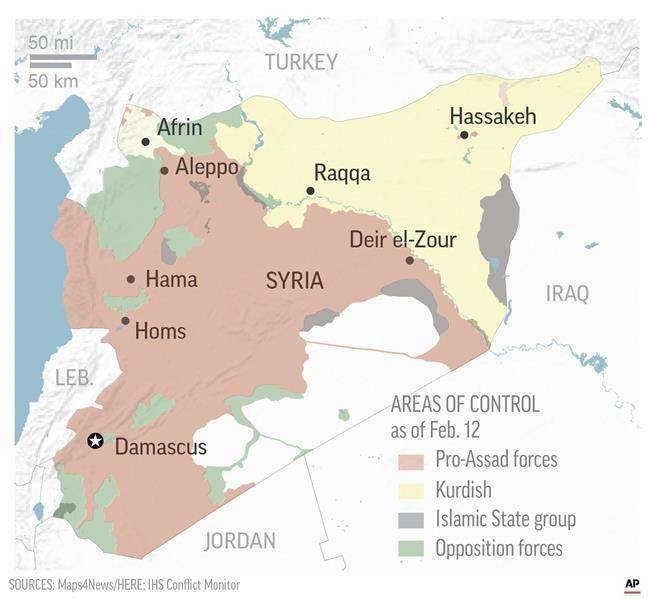 Syria’s Afrin Move: “Artful Assistance To Allies” Or “Armageddon In The Making”? Syria reportedly agreed to the Kurdish PYD-YPG “federalist” militia’s request to enter Afrin and stop the Turks’ military advance, though it still remains to be seen whether Damascus will actually carry through on this decision or not. There have been conflicting reports on this topic all across the past week, but the official “Syrian Arab News Agency” (SANA) confirmed that the “Popular Mobilization Units” (PMU) will deploy to the region in order to thwart the Turks, debunking earlier claims that the Syrian Arab Army (SAA) will directly do so instead. Even so, this would b e a very dangerous development if it actually happens because it could quickly lead to the Syrian Arab Army (SAA) entering the fray in support of their pro-government partners and thus sparking a conventional state-to-state war with Turkey. Syria has every sovereign right to deploy its own forces and those of its allies anywhere within its territory, but taking a step back from principled idealism and soberly assessing the reality of the situation, this might not be the wisest decision at the moment. The Turkish Foreign Minister warned in no uncertain terms that his country’s military forces will not be stopped by the SAA or its allied PMU if they intervene on behalf of the PYD-YPG “federal” Kurds that Ankara equates with the terrorist-designated PKK, and it’s very likely that the war-weary and completely exhausted Syrian military might be routed by the much more powerful Turks if “push comes to shove”. Not only that, but there’s close to no possibility that Russia would get involved in “saving Syria” either since its military mandate is strictly for anti-terrorist purposes and President Assad’s closest advisor Ms. Bouthaina Shaaban confirmed that Moscow withdrew all of its ground forces except for a few remaining aircraft. In addition, Dr. Vitaly Naumkin – Russia’s premier Mideast expert and the man who’s playing a crucial role in organizing Moscow’s peacemaking efforts in Syria – wrote in the position paper released at the beginning of the prestigious Valdai Club’s two-day conference earlier this week that “part of the government elite may have greater hopes for military victory than the dividends that negotiations would eventually pay”. This is the strongest statement yet of Moscow’s growing impatience with Damascus’ refusal to enter into the “compromises” that President Putin suggested that the authorities make back in November in order to facilitate an internationally brokered peace to the conflict. On top of that, Damascus rejected the outcome of the “Syrian National Dialogue Congress” just last week, which may have prompted Naumkin’s stark warning about so-called ‘hardliners’ who might prospectively impede the peace process. Bearing in mind this high-level official’s words and the fact that Russia withdrew most of its military forces from Syria, as well as Moscow’s visibly growing dissatisfaction with the Syrian government’s procrastination on making any tangible progress towards a “political solution”, there are concrete grounds for predicting that Russia would not support the SAA if they enter into conflict with the Turks, further amplifying the existential risk that Damascus faces if it allows the Kurds to “play them like a fiddle” and falls for this disastrous scenario. It might be for this reason why the authorities never carried through on their implied threat to dispatch conventional military units to Afrin, begrudgingly realizing after President Putin’s phone call with President Erdogan that Russia would “hang them out to dry” as they initiate what might have amounted to an act of “national suicide”. Nevertheless, the situation is still highly combustible right now and a larger war could break out at any time due to even the slightest miscalculation by the Syrian side, thus leaving the whole world watching with bated breath to see what happens next. The CIA’s mission is to create chaos everywhere on the Earth including the United States. The CIA assassinated JFK and the FBI framed Oswald for it. The CIA murdered the Parkland HS kids with the help of the infiltrated FBI and the FBI will now frame the patsy. Oh, and the Vegas massacre was another CIA production. The iXXI genocide in NYC and DC was another CIA-FBI production. That’s only the top of a very long list of CIA/FBI (Deep State) crimes against the American people and foreign nations. WTFU! Please!